The Seven Deadly Sins. Find the information about it here! Morning guys, my topic today is quite complicated. It’s about the seven deadly sins. All of you must ever hear about this one. Every people talk about it, Actually, what is it about? 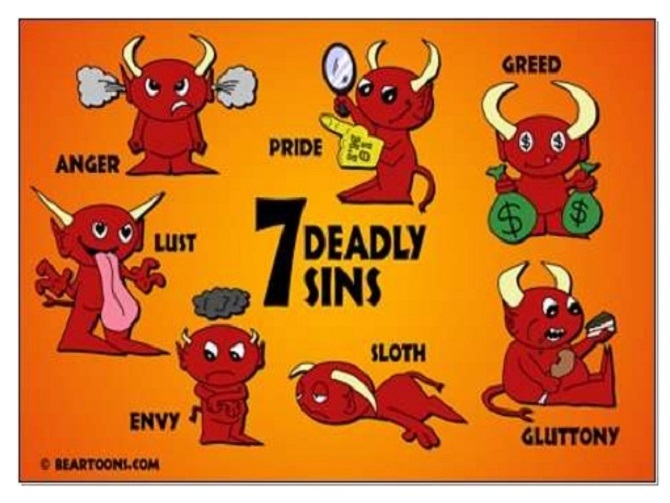 In my opinion, seven deadly sins are some kind of sin that’s really destructive in the human heart. Also, this one also related in the Christian Bible. But that’s not about the today topic. My purpose only tells you about the sins. That’s why for you who curious about this, check out the list below of the seven sins. The Seven Deadly Sins, Check the list Below! Lust: The first sins is lust. It’s an intense desire to having everything or something similar. Usually is related to sexuality content. Gluttony: This sin is desire more food and drink. I know you must ever meet this kind of people in the world. They eat like a person who never eats one month. Greed: Actually this one similar like lust. But, if lust focuses on sexuality content, greed focuses on material aspects. Without I giving you the example you know the type of people like this exists in every country. Yeah, people who can say the material is the ultimate problem that can solve anything. Sloth: you can say this sin is suitable for a lazy person. Yeah, type of people who lazy to do anything. You know a type of people like this exists in this universe. I recommend you avoid this one. If you lazy to do anything, what will you do in this life then? The answer is nothing. Wrath: It’s suitable for people who usually get angry over a small problem. You need to be cautious with this type of sin. Because if you ever do something small they will angry at you. Also, they always take a grudge to some people who ever hurt them. Envy: It’s some kind of jealousy over something that you didn’t have but others have it. This is the type of people that I hate the most. If you want something that everyone has, just work hard to obtain it, rather than you show the jealousy. it will make all people hate you. Pride: The last of the deadly sins. Of course, Without I explained it, you already the means of pride. Yeah, the type of people who cold headed. Also, they don’t want to talk with the people who the status lower than them. Because it can hurt their pride. What do you think about the seven deadly sins that I explained it to you above? Is it clear enough for you? I know every human have their own sins. I can’t recommend you to avoid it. Why? Because it’s an impossible thing to do. I just want to make sure you know the sins of yours. Okay, guys, I think it’s enough for today article. If you want to add something about deadly seven sins, don’t hesitate to give a comment below. See you all again next time and have a nice day.